Its Minder On The Orient Express, which completely earns its punning name by, well, being an episode of Minder set on the Orient Express. George Cole was so settled as grown up Flash Marry Arthur Daley by this point that really all the writers generally had to do for an episode of Minder was just think of a scenario and the rest would pretty much write itself. Lovable rogues pepper British TV (we will see more in this list) but Terry and Arthur had a peculiarly 80’s Bromance, and nothing was more bromantic than this jaunt on the Orient Express. Actually, that’s not strictly true, its a classic example of the stories where Terry was desperate to be shot of Arthur (who here has split him up from his girlfriend so he can escape the plod on the trip on the Orient Express). But it was fun, and a darn sight better than another Agatha Christie. 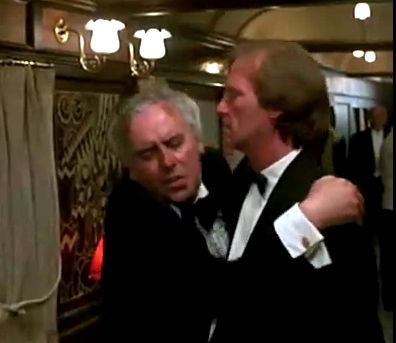 There is not much Minder on Youtube, but here is a compilation of all of the actor James Coombes scenes in Minder On The Orient Express. “Better than the standard episodes of the show” I would strongly contest, though it is true that the mid-eighties series were rather cosy and predictable (the harder-edged early episodes are terrific and the last Waterman series in 1989 – when its clear that he’s too old to carry on doing this for much longer – is a real return to form). It feels different because it is different, Euston Films pitching themselves as a Film production company with ambitions beyond television for the first time since the two theatrically-released Sweeney films. So it goes on for a l-o-n-g 120 minutes, is shot on 35mm film and has incidental music. Its a good caper film, but lacks the satisfying short story form of the normal episodes, or their authentic London location local colour (always one of the great Euston strengths). Best enjoyed for the casting of Maurice Denham, Honor Blackman and Adam Faith. To be fair, I probably saw one episode in five of Minder in the eighties, and was forced to watch this one Christmas with family who were regular watchers which made me appreciate the dynamics in the show more. It is a bit too long (great on Christmas day, as it means you don’t have to worry about what you are doing next) but the real antagonism between Terry and Arthur in the first third is surprisingly visceral. It is too long, and admittedly overstuffed, but plenty of fun.